I am anticipating a difficult day today. My first challenge is to find the bridleway from the Woodspring road to Wick St Lawrence. The start of this public right of way is cunningly disguised as a Private Road! The walk from Woodspring Priory to Clevedon would only be 4 miles if I could follow the seashore. Yesterday, from the high ground above Woodspring Priory, I could see an easy-looking route along the sea wall. But later I would have to cross the river Yeo, and there will almost certainly be sluices, fences and locked gates. The first section of the hidden bridleway is somewhat overgrown, but very passable. A little bit of mud around a gate, and then I am in open fields, where I need to use my map navigation skills as there are no marker posts to help me. I arrive in Wick St Lawrence. It’s not really a village, more a collection of farms and isolated houses, strung out along a couple of rural roads. But it makes for very easy and pleasant walking, despite the gloomy day. A strange sight. A cow suckling four calves at the same time. I wonder if they’re all hers. I enjoy this walk. Agricultural scenes. Proper, working farms. Love it. I pass a man who says, “You look as if you haven’t a care in the world!” I realise I must be looking as happy as I feel. But my good mood is about to change. David Cotton walked this way some years ago, and described the route he took on his website. He followed a track down to the river bank, then through a culvert under the M5, followed by a minor ‘trespass’ along the banks of the River Yeo until he came to the first footbridge across the river. I plan to follow in his footsteps. 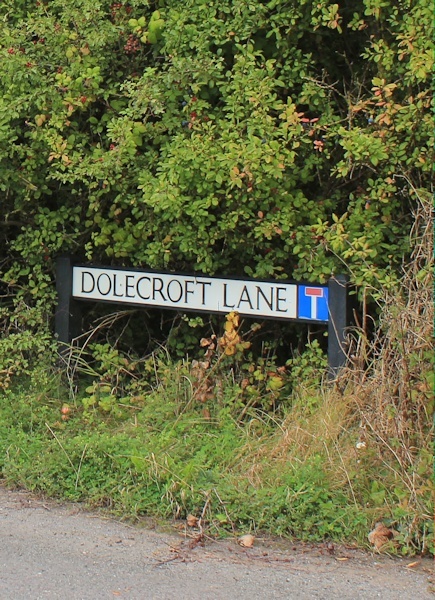 I find a small lane – fittingly called Dolecroft Lane – and I know this leads to the track that David described. So far, so good. But I come across a series of locked gates. There may be stiles hidden in the thick undergrowth on either side, but I can’t see them and am forced to climb over the gates, becoming increasingly uneasy with each barrier I come across. 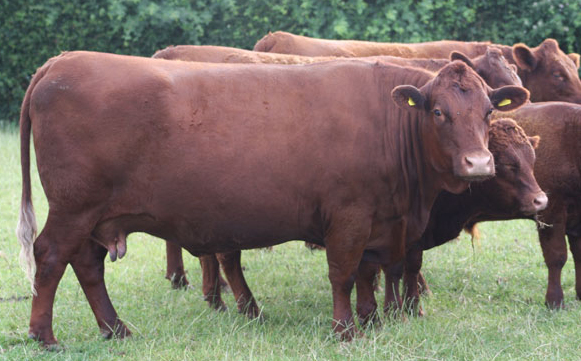 A field of cows. Another gate. A paddock used for horses, with saddles and nose bags and other riding equipment strewn nonchalantly over gate posts and fences. It all gives the appearance of private land. But I know it is marked on my map as a public footpath. I stride onwards. The last gate is very stiff and squeaks loudly. Now I am on the bank of the River Yeo, but this area is clearly set out as a small jumping arena for ponies. And, when I climb up onto the river bank, I see a couple of tents. If there was anybody within the tents, they must have heard the squealing gate. I feel like an intruder and turn to my right, where I know the footpath is supposed to follow the river bank until it reaches a culvert under the motorway. I can see the M5 and the rushing traffic. Only a couple of fields away. But the bank ahead is blocked. First by a single-strand wire fence and then, more successfully, by a thick mass of tangled brambles. Looking at the dense barrier of thorns, I know I can’t get through. Defeated I turn back and trudge, feeling angry now, back through the jumping arena, the paddock, the field of cows, down the track and Dolecroft Lane, to the road I’ve just left. Luckily I have a backup plan. Plan B. Further on is another footpath, marked on my map and leading, apparently, to a different culvert under the M5. Once through, and on the other side of the motorway, the footpath continues down to the River Yeo. Onwards. I find the footpath. It’s another track, possibly the remains of an old road abandoned when the motorway was built. Rather ominously, I see no footpath signs. But it’s a pleasant track, and ends in a field covered in the most enormous clover plants. They come as high as my knees and are laden with dew, dampening my trousers. I look out for any ‘lucky’ 4 leafed clover variations, but don’t see any. There is no sign of a path now, but the route, according to my map, continues on and curves gently across the field to meet the M5. The only thing that spoils my walk through the clover field is the roar of traffic from the motorway, on my right hand side. Then – hooray! – I find the culvert under the M5. But my heart sinks when I see the metal steps leading downwards are covered in brambles and nettles. Luckily I have my walking poles, and I begin to beat the brambles into submission. After some five minutes of beating down the brambles, I find a hidden sign on the steps. It warns of DANGER and is designed to turn me away. But surely this is a public footpath? I go down the steps and enter the tunnel. And I’m relieved to find a solid walkway with a guard rail, running alongside a large pipe, and can see daylight on the far side of the tunnel. My heart is thudding and I feel a surge of relieved excitement when I reach the far end of the tunnel – but I am in for a big disappointment. The steps up the other side are covered in brambles too. I should have anticipated this, of course. But the overgrowth is much worse on this side. And I can’t even see where the steps begin. I stand and consider my options. I could start beating down the brambles. But it will be much harder clearing a way up the steps. And I have no idea how thick the obstruction is. It could be three or four feet. Or it could go on for a hundred yards. Or more. 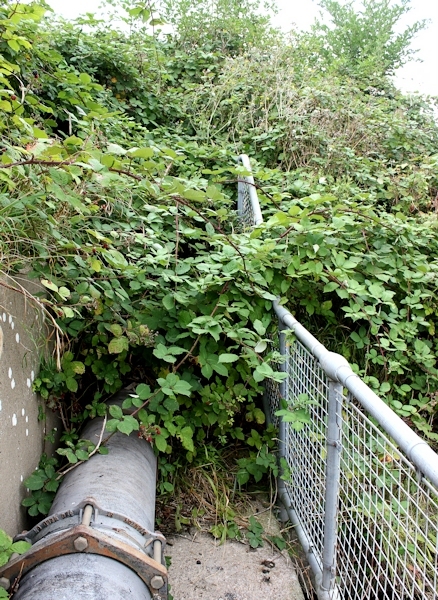 Standing at the bottom of the culvert, it is impossible to see where the brambles end. After a few, dithering minutes, I decide to retrace my steps. I am not a happy woman at this point. But I trudge back through the red-dust of the culvert, up the bramble strewn steps and then back through the field of giant clover. The road takes me up and over the M5. I’ve been under it (twice) and now I’m going over it. Sigh. Now for my backup to my backup plan. Plan C. On the other side of the M5 is the start of another footpath. This one, clearly marked on my map, runs down the side of the M5 to the river bank at a junction where the little Oldbridge River meets the wider River Yeo. At this point, I should meet the original footpath – the one I have been trying to follow. I know that from here David Cotton walked along the bank of the River Yeo (trespassing, technically, because the bank is not actually a footpath) to reach the first crossing point over the River Yeo at a sluice called Phipp’s Bridge (where there is a footpath). Again, I hope to follow in David’s steps. But first I have to get down to the river. And the start of my new route isn’t promising. A farm gate with a sign that might have read ‘No Entry’ but has been covered over. No footpath post or symbol. Oh dear. Onwards. There is a nice track running down beside the motorway, screened by a bank of trees. It turns into a fields. 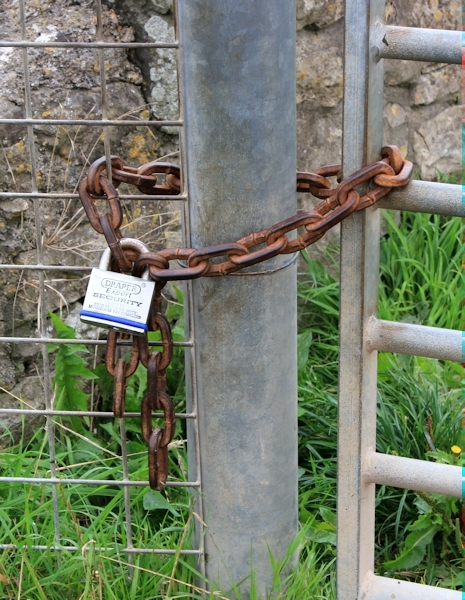 Another gate – but unlocked and with no keep out signs. This looks hopeful. I reach the bank of a small river – the Oldbridge River. There are some newly constructed wooden platforms. For fishing? The grass on the bank is short. It all looks very domesticated and rather pretty. Looking to me left, I can see the culvert under the motorway. That’s my culvert! It looks so near – and perhaps I could have got through those brambles if I’d really tried? Maybe. But the bridge seems to be closed. Rusty gates bar the way and there is an obstruction at the other end with a sign. I can read the words ‘WARNING’ and ‘DO NOT ENTER’. Also, somebody is using the bridge as a storage area – blue drums and fencing poles are piled up. Perhaps the bridge was damaged during the recent flooding and is impassable? Or perhaps I am not on the footpath after all? I pull my map out. Yes, this is definitely a footpath. Perhaps it has been diverted? But if so there should be official county council notices to tell me about the diversion. I don’t know what to do and walk along the river bank for a little way, wondering if there is another way across. At the end of the field I find my way blocked by a deep looking rhyne. In the next field, I know I should be able to pick up a footpath that leads me to a tiny place called Hewish, and then down another path to Phipp’s Bridge. It would be an alternative, although longer, route to get across the River Yeo. That route would be my last resort. Plan D.
Someone is using this area as some sort of adventure playground. There are various obstacles laid out and I find a rope bridge strung across the rhyne. Bridge is rather too grand a word. Three pieces of rope: one for the feet and one on each side to act as handrails. It’s a measure of my desperation at this stage that I even consider crossing the rope bridge. I try to reassure myself that this is possible. Look – there is a handy ladder in the water, so I can climb up onto the bank if I fall in. Feeling defiant, I return to the blocked bridge and determinedly pick my way across, through blue barrels, piles of wood and nettles. At the far end of the bridge I see the warning sign is attached to some sort of water bowser, and the bowser is obstructing the exit to the bridge. 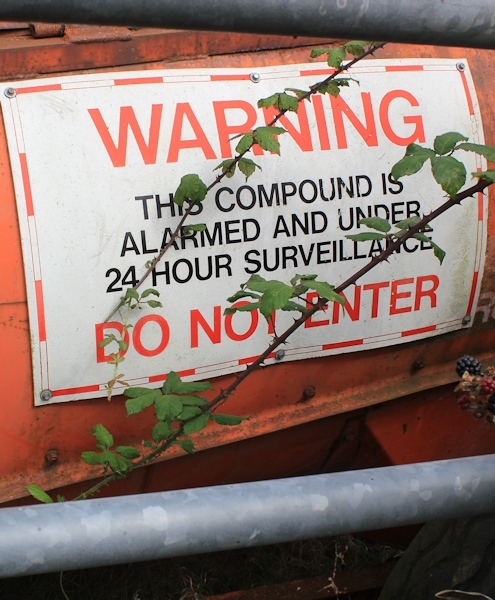 The warning sign reads: THIS COMPOUND IS ALARMED AND UNDER 24 HOUR SURVEILLANCE. It suddenly occurs to me: the sign may not be intended for my eyes at all. This isn’t a ‘compound’ and there is no evidence of any CCTV or alarms. Perhaps the bowser is just another piece of abandoned equipment being stored here? And it’s just a coincidence it appears to be a deterring sign on the bridge? Then I see a stile, just to the left of the bowser. 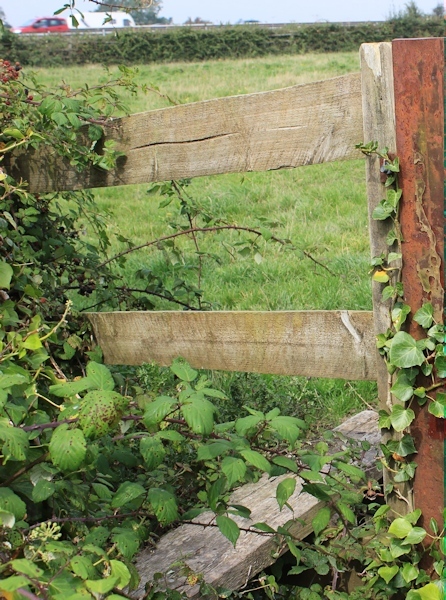 It is overgrown with brambles and hidden by equipment, but it’s definitely a stile. I climb the stile, carefully, because of the brambles, and rickety planks, There is not much space to jump down on the other side, with the bowser in the way. But I manage it – and suddenly I’m over and on the other side of the Oldbridge River. The official footpath turns right at this point and follows the bank of the Oldbridge River, but I have other plans. A quick scramble up a green slope, and now I’m standing on the high bank of the River Yeo. At last! There are swans and nearly-grown cygnets. Nobody in sight. A lovely, peaceful scene. I begin to walk along the Yeo. For the first time I am not on a proper footpath, but, ironically, the grass is short and the going is easy. I’m heading for Phipp’s Bridge. Finally I am making progress. This entry was posted in 11 Somerset and tagged footpath, travel, walking. Bookmark the permalink. Ahh, Somerset and its irritating ‘bring your own machete’ approach to footpaths. There were some that I tried to find that had clearly not existed for years. Pity, because apart from that it was perfectly pleasant and most of the people were lovely. I’m afraid to say that you’ll find the problem persists as you make your way across the county. (Unless you already have but are still writing things up – it takes longer than you think, doesn’t it? – in which case, well, you’ll probably know what I mean). I’ve reported two of the blockages to North Somerset Council. Could have reported more but there is a limit to how much time I want to spend working out map references. I had a very stressful day at work today. Still, I got home, had a glass of wine and settled back to catch up on some blog posts. Your one was the first I came to. And I thought work was stressful…! I’m curious – do the councils ever get back to you when you report these blockages? Sounds like you have quite an adventure this time. I’m afraid I played it safe and opted for your Plan D (via East Hewish). It’s probably not as interesting or scenic though. Interested to hear if you get any response from council about the various footpath problems. The presence of that bridge through the Culvert does suggest the footpath was diverted under the motorway, but has been abandoned since then. I can’t think why else build the path next to it, unless it is just for maintenance of the pipe? I’m still not sure if the walkway through the culvert was ever intended as an official footpath or whether only to provide maintenance for the pipe. But my guess is they built it as a footpath, originally, as a sop to public opinion when the M5 was first constructed. (I think it’s quite difficult to officially decommission a footpath). Now they quietly hope that everybody has forgotten it exists, and that is why they don’t put up footpath signs or advertise the route in any way. Let’s see if the Council responds to my reports. You really should consider getting the Viewranger app and download selective 1:25000 OS maps. I’d venture to say that it’s impossible to miss a footpath, and like you, I’ve come across places where the path is invisible but I follow the OS map on my iphone and it’s never let me down. True, I’ve had to resort to bramble hacking, but I know I’m right! I’ve even faced down farmers who have challenged me, and I’ve challenged them right back. One had the cheek to say that I was wrong – then I asked him who had removed the waymarks (I’d seen the distinctive triangular patter of nails on a post nearby). He got very defensive then and said it was “someone else”. “So this IS a footpath” I said, and he had the grace to back down. This was one of my most frustrating days ever on the coast path, I feel your pain Ruth! On one of the “routes” I tried a herd of cows chased me out of a field. Next to the bit around Port Talbot and Liverpool this was my worst day ever so you can seek some solace in that! Hi Martyn. What a shame this is such a difficult area to navigate. Somerset is lovely but the council doesn’t seem to take care of the more minor footpaths. And it could be so very pleasant if they just opened up the sea wall to walkers. Port Talbot = Ugly 🙂 no sign of a cow in that area!! I’m sorry to read that you experienced so much frustration in attempting to follow your initial route but I also think you’re incredibly brave for crossing so many gates without waymarks or signs! It’s the kind of thing that frightens me when I’m out sometimes. I was quite excited to see that path going UNDER the M5 but what a shame you couldn’t cross it, as there aren’t many like that. I only live a few miles from Hewish and can testify from a few of the ‘paths’ just south of here that they’re not very well maintained at all. Some are obstructed with fencing, paths may be ‘hidden’ or overgrown, waymarking is sometimes absent and even the odd diversion is unclear. It seems as though only the most-frequently-walked routes are the ones in good order. I think I know what those rope ‘bridges’ are – back in primary school, I did a week with Mendip Outdoor Pursuits and in our teams, we were required to cross such ‘bridges’ among other challenges.They used to tell us the rhynes were 9ft deep… I was one of only 2 people from my entire class who didn’t even attempt it! Floods of tears and all, as I apparently cost my team 10,000 points!! I will add that the other ‘bridge’ had only ONE rope to hold on to!! Wow, Olly, what a coincidence that you live so close by to this section 🙂 And I am absolutely sure those are the same rope bridges that you faced on your Outdoor Pursuits jaunt. I didn’t take a photograph of the other one, but there was a second one and it only had ONE rope to hold onto, not two – just as you remember! I’m not surprised you refused to cross. Very sensible of you. Hi Ruth – I have also used David Cotton’s 2003 walk of this section as a guide for when I tackle Burnham through to Chepstow next year – Hopefully the glacial progress of the creation of the English Coastal Path will eventually make such torturous sections more manageable and pleasant, and result in some very useful shortcuts and extra bridges. I thought I was the master of making an epic out of an apparently benign outing but I can only recall one episode that was nearly as dramatic (too long a story to write here). Huge congratulations for having the presence of mind to take the photo of that cow – mishaps and oddball happenings are so much more interesting! I have the the “OS 1:50000 GB complete” maps on mi iPad Mini and on my iPhone with gps. On my last trip I didn’t carry any paper maps. There can be occasions when there is not enough accuracy to tell if you are on the correct side of a field’s hedge, especially as 1:50000 doesn’t show field boundaries, but that is a minor point. For the iPad I have an excellent waterproof case from Outboard (Google, they have a super website). I would find it very hard to give up my paper maps. The screens on my iPhone and Garmin are just too small and, as you say the 1:50000 is not really detailed enough. Viewing maps on the iPad would be fine, but I’m a bit nervous about carrying mine on walks – I have the full sized version. So at the moment I have my paper OS Explorer Mapto show me where I’m going, my Garmin for showing me where I’ve been and where I am at any given moment, and my iPhone for summoning help if necessary! It is such a shame that those paths are so badly maintained but not much of a surprise. I wish councils had a little more regard for walkers and kept footpaths cleared and properly signposted. Even here with the wonderful Itchen Navigation, signs go up saying sections are impassable and then stay there for many months after the problem has gone. This tends to lead to me ignoring all such signs and keeping my fingers firmly crossed. So far, apart from wet feet, I’ve not met with any real disasters. Guided by your frustrations on this section, I managed the Weston to Clevedon walk this week in a fairly comfortable day, closing my ears to the siren attractions of a possible downstream crossing of the Yeo, and going straight for your Plan D. You still have to keep your wits about you because of the curious Somerset habit of footpath fingerposts pointing into large open fields with no further guidance on where the path goes. Chicken and egg I suppose; if the paths were better maintained more walkers would use them, leaving clearer paths. Anyway many thanks to you for your proxy suffering, and a Golden Raspberry to Somerset Council for ignoring their footpaths. A walk full of drama and frustrations! I think you are very brave to keep going in the face of adversity. I would have probably turned back at the first Private Road’ sign.